Sunil Bhardwaj from Faridabad, B.E. - B.Tech Graduate. SQL DEVELOPER BASIC LINUX COMMAND.. SIEBEL CRM ON DEMAN.. ODI-ORACLE DATA INT.. ORACLE SALES CLOUD ORACLE APPS ADF-APP.. SIEBEL CRM ORACLE ELOQUA JQUERY XML-XHTML-CSS AND H..
are one of expert skill area's of Sunil Bhardwaj . 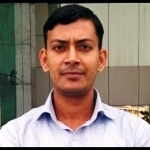 Sunil Bhardwaj is working in IT Software industry.